The Ebola (pronounced ee-BO-luh) virus is the common name for a severe, often-fatal bleeding or hemorrhagic (pronounced hem-or-RAD-jik) fever that first appeared in 1976. It is caused by a new kind of virus called a filovirus (pronounced FY-low-vye-russ) that kills most of its victims with frightening speed. The source of the virus is unknown and there is no cure. As a viral hemorrhagic fever, the Ebola virus infects its host and causes sudden fever, muscle aches, and weakness followed by vomiting, diarrhea, breathing and kidney problems, shock, internal and external bleeding, and usually death. It is one of the most deadly disease-causing agents known, and is classified as a Level 4 pathogen (pronounced PATH-o-jen). For comparison, the disease known as AIDS (acquired immunodeficiency syndrome) is only a Level 2 pathogen. This new disease is particularly horrible and has been described by one author as a "molecular shark" that can turn "virtually every part of the body into a digested slime of virus particles." This means that the victim's internal organs break down, with blood oozing eventually from every part of the body. The first time the new, thread-shaped filovirus was ever seen was in 1967 in Germany and Yugoslavia. In both those countries, research laboratory workers became violently and desperately ill. Seven of thirty-one workers died. All had one thing in common: they had been exposed to the tissues and blood of several African green monkeys. Doctors soon examined the victims's blood and discovered a virus resembling a tangled rope that was unlike any virus they had ever seen. Following this incident, which gave the name Marburg virus to the new microorganism, there were a few cases in the African countries of Zimbabwe, South Africa, and Kenya. 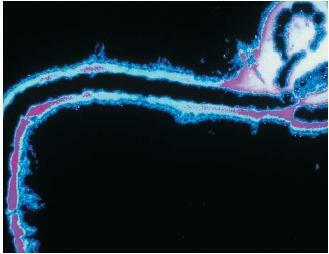 Filovirus: A family of lethal thread-shaped viruses that includes Ebola and Marburg. Virus: A package of chemicals that are far smaller than the living cells they infect. Viruses are not classified as living organisms, since they cannot grow and reproduce on their own, but rely on a host cell to make copies of themselves. However, in the summer of 1976, a new version of the filovirus appeared in two major outbreaks that occurred almost at the same time. The first of these emerged in the country of Sudan, and the other in the country of Zaire (now known as the Democratic Republic of the Congo), some 500 miles (800 kilometers) away. In both places it was as if a deadly biological bomb had gone off, with hundreds of people becoming ill and dying at a terrible rate. These large outbreaks resulted in more than 550 cases and 340 deaths. Examination of the virus showed that it was similar to the Marburg virus, but not the same. In fact, it was even deadlier. It came to be called the Ebola virus, named after the river in Zaire where it was first recognized. Since that first outbreak in 1976, four subtypes or versions of the Ebola virus have been identified so far. The first three, called Ebola-Zaire, Ebola-Sudan, and Ebola-Ivory Coast, are known to have caused disease in humans. The fourth, called Ebola-Reston after the Reston, Virginia, primate laboratory where it was first discovered, seems to only be transmitted by monkeys to monkeys, although it may be the only one of the four viruses that is airborne (meaning it can be spread through particles floating in the air). People can get the first three Ebola fevers through direct contact with a sick person. This usually happens to hospital workers or family members who are caring for a severely ill victim and who somehow become infected by coming in contact with the victim's blood or other body fluids. In very poor countries, people often are infected when needles are reused instead of thrown away. Within a few days of being infected, most new victims experience a high fever, headache, muscle and stomach pain, fatigue, and diarrhea. Within one week of being infected, most patients experience chest pain, shock, bleeding, and death. Researchers have no explanation for why some people are able to recover from this devastating illness. There is currently no standard treatment for the Ebola virus that results in anything more than making the patient comfortable. The one standard therapy in use is to make sure that patients receive enough proper fluids, as well as maintaining their blood pressure and providing a good supply of oxygen. In hospitals, Ebola patients receive what are called barrier nursing techniques, meaning that they are isolated from other patients and only are tended to by workers who wear protective clothing, masks, gloves, gowns, and goggles. Complete sterilization procedures are also strictly followed. Although the filovirus family has been known since 1967, scientists still have no idea where the virus lives in nature. So far, every case has been a secondary one, meaning that it was caused by contact from another. Nor do we know the exact mechanism the virus uses to enter the host cell. No drug is known that will work against the virus, nor is there any immunization (pronounced im-mew-nih-ZAY-shun) technique available to protect someone from exposure. No vaccines (pronounced vax-SEENZ) have yet been developed. During the late 1990s and into the new millennium, minor outbreaks had been reported with some regularity in different parts of Africa. Although there is a great deal to learn about this terrible new disease, we do know that Ebola viruses are found only in Central Africa. Although the source in nature is not yet known, it appears that monkeys are susceptible to infection. The very deadliness of the disease has so far worked against any really massive health disaster because it kills its victims so quickly that they do not have a great chance to infect many others. In some ways, the virus burns itself out before it can spread to a major population center. No case of Ebola fever has ever been reported in the United States. am a medical student in mulago and i have really appreciated your achievements in the strugle of research department and epidimiological study of the epedemic ebola.thanks. i,m doctor from indonesia now working in DRC africa,i want to know is there any possibility spreading this virus by air from patient ebola to other people? I know this thread is old, but ebola reston is the only strain known to travel via the air. THis is the only strand that is asymptomatic in humans, but affects pigs and non human primates. Has anyone explored the source of soil as being the primary agent of the vrus? The soil of the African continent is rich with virus that can easily adapt to a host carrier that can be any mammal or avian carrier that allows further modification of the virus and spread to an organism that supports transport. Have there been any studies of soils in the continent and areas where initial outbreaks are reported?